Engineers and other technical experts take to the web to educate themselves on their options now more than ever before. When sifting through online content, engineers and other experts in their fields want facts, not a hard sell. They’re conducting serious research. In fact, according to a study by CEB in partnership with Google, 57 percent of the B2B purchasing process has been completed by the time someone contacts a salesperson. So, as content marketers, we need to give them the information they need to make smart purchasing decisions. But engineers have already studied for years to accrue their subject matter expertise. Can marketers actually talk intelligently to them online? A marketer’s challenge lies in extracting the best information and translating it into relatable content, while not sacrificing accuracy in the process. Journalists like Ed Yong and Carl Zimmer bring cutting-edge science to the masses on a regular basis, and content marketers can follow their leads. 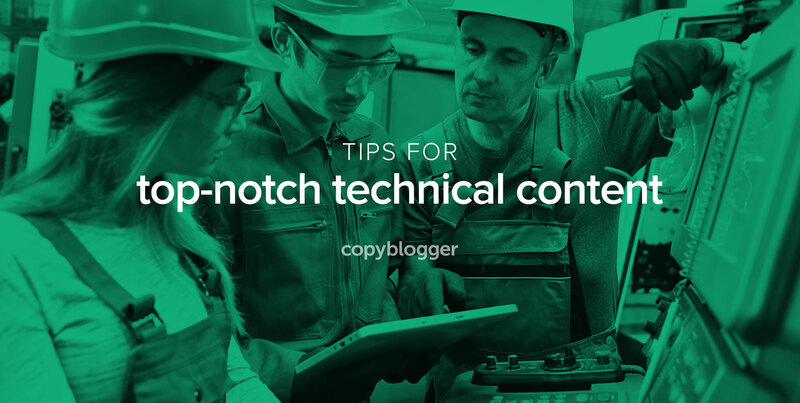 Here are three content marketing tips that non-experts can use when writing about technical subjects. When you interview experts within your clients’ companies and mine their heads for their hard-earned knowledge, you’ll find that many of them love to be asked about their fields. It’s not every day a layperson asks a metallurgist about induction furnaces or an architect about designing aircraft hangars. Fair warning: At first these interviews might be overwhelming or intimidating. Marketers often feel afraid to ask “dumb” questions. However, a state of “non-knowledge” is a great place to start. Admit to your expert that you’re not too familiar with their topic, and they’ll realize that they need to start at the beginning. Ask them to use long-form phrases instead of acronyms, and never let them gloss over something you don’t understand just to keep the conversation flowing. Asking for clarification shows how closely you’re following along. Get approval from a company’s communications or marketing department before talking to any technical experts. You want to make sure they don’t divulge any proprietary or protected technical information that could get them in trouble. Once you’ve written your content, have the company’s legal team review and approve any information that will be published outside the company. Read what’s already been written so that your target audience doesn’t have to, and synthesize that content in a way that is straightforward and easy to understand. Google Scholar and government websites are resources you could use to conduct your own research. For example, if new EPA rules affect how your client engineers their generators, go right to the source. Government agencies will have published those rules, so familiarize yourself with them and learn how they’ll affect your client’s customers. It’s a content marketer’s job to simplify ideas so that they’re accessible, but not so much that they’re inaccurate. Metaphors and storytelling are great techniques to incorporate into your content. Can you make a connection between something complicated and something that’s encountered by most people on a regular basis? You also want to consider the different types of people who may read your content. Will highly technical engineering content resonate with your target audience? Or do you need to produce content for a decision-maker who’s considering how an investment will affect the bottom line or deliver ROI? If both types of people are part of your audience, consider how your content marketing strategy can satisfy both perspectives. When writing online content for a technical audience, it’s imperative to keep your overall goal in mind. You want to cultivate trust by providing education — not by being a pushy salesperson. B2B content marketing that informs helps marketers give technical audiences the content they’re looking for. And they’re likely to remember where they got that help when it comes time to buy. Do you write for a technical audience? Share your methods in the comments below. Kyle Fiehler is Senior Writer for the B2B industrial marketing agency Gorilla 76. He frequently writes on topics concerning general contracting, manufacturing, and industrial painting. One thing that I’ve found invaluable when interviewing technical subject matter experts over the years is to record the call and then have a transcript done. I let the expert know right up front and it’s never been a problem. This not only allows you as the interviewer to focus on the conversation at hand, but later when you get down to the job of actually writing, having a transcript allows you to pull exact phrases, becomes a good source of pull quotes and most importantly. write using the voice of your intended audience. Definitely, it’s hard for a non-prof to interview such expert most especially when the person interviewed is quite intimidating. So what’s on the interviewer’s head is to make good impressions on the questions asked, but sometimes interviewer becomes too anxious for that. It’s right to inform the interviewee about the unfamiliarity of the topics. Great blog! In decades of working with engineers, here’s a trick I learned. Engineers think in numbers and pictures. Bring your notebook to your interviews, and ask engineers to sketch pictures in it as you go along. Have them walk you through the pictures step by step. This practice helps you understand really complex topics so you can draw a picture and explain it to someone else. It also speeds the process of creating and finding relevant visuals to go along with your easy-to-read copy. Thanks for your good article. Really just amazing and killers points for content marketing . I started blog one year back and that’s why this post is really helpful for me as well for every bloggers. Now-a-days Content marketing is the best one method to do Ranking on Google. I am going to follow your these tips for my own blog to do content marketing. Keep sharing. As mentioned in the article, technically trained people often enjoy talking about their fields, especially if the interviewer can “keep up” in the conversation. To win the expert’s confidence, prepare for the interview by doing your homework and preparing a few specific questions. The expert is likely to be impressed and give you more information.